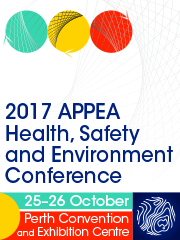 APPEA’s Health, Safety & Environment Awards recognise achievement, initiative and innovation in the Australian oil and gas HSE performance. 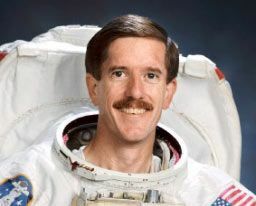 This year there were 11 outstanding finalists. The four awards were presented on 8 September at the 2015 APPEA HSE Conference and Awards Dinner, held at Crown Perth, Burswood. 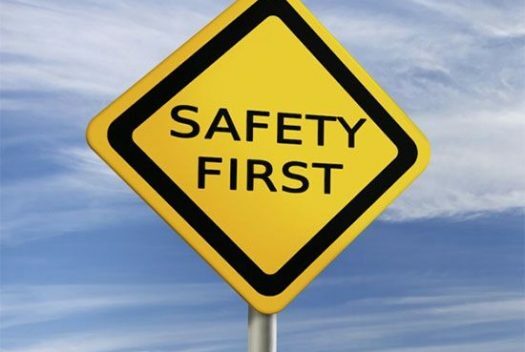 The Health and Safety Award and the Environment Award were judged by two panels of industry practitioners with expertise in the respective fields. There were also two Delegates’ Choice awards – one for Health and Safety and another for Environment. These allowed all conference delegates to vote for the work of their peers based on the finalists’ posters on display in the exhibition area, which provided a snapshot of the projects submitted by all of the Awards finalists. 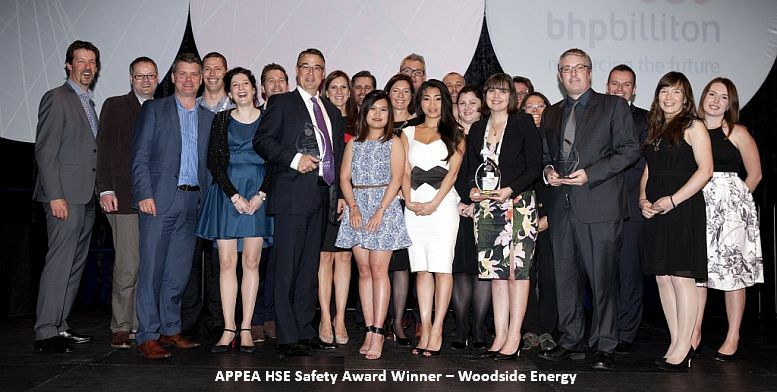 The winner of the 2015 APPEA Health and Safety Award – and also of Delegates Choice Award for Health and Safety – was Woodside Energy for “Use of Remote Digital Video Inspection in a novel LNG turnaround application”. This initiative used existing Remote Digital Video Inspection (RDVI) technology in a novel way to reduce risks for workers by minimising the need for confined space entry. Eliminating the need for 36 confined space entries achieved savings of almost $4.5 million, and reduced the turnaround from 35 days to 25 days, with zero recordable injuries. RDVI has been previously trialled on Woodside facilities for one-off inspections, but coupling of it with non-intrusive inspection techniques during the 2015 Pluto turnaround is a new approach that not only eliminates the requirement for confined space entry but also enhances inspection in hard-to-access areas. The winner of the 2015 APPEA Environment Award was Chevron Australia for “Gorgon Project domestic gas pipeline construction and rehabilitation”. Chevron’s 90km Gorgon domestic gas pipeline traversed sensitive intertidal and terrestrial sections of environmentally significant mangrove and samphire communities. It required careful monitoring and planning before, during and after construction. The pipeline route was planned to minimise environmental disturbance and preserve 100-year old trees. Creeks and water courses were rebuilt back to natural contours to ensure they flowed at their natural capacity. Chevron also planted more than 4000 mangrove seedlings. The winner of the 2015 Delegates’ Choice Award for Environment was Woodside Energy for “Managing marine biofouling in the petroleum industry”. The 2015 APPEA HSE Conference and Awards Dinner was sponsored by BHP Billiton Petroleum.